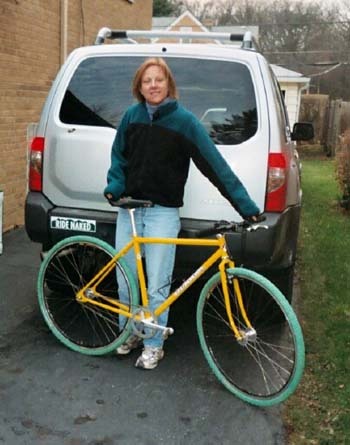 My name is Pam and I am a fixed gear junkie. My best friend, Duncan, and I ride fixed gear offroad around Chicago. Our friends think that we are crazy and wonder why we do it. We have told them how much fun it is but haven't managed to convince them of the thrill and enjoyment. Truly, riding is believing. Duncan started riding a fixed gear six years ago, after reading articles related to developing a spin. He became enchanted with the bike's simplicity and a couple of years ago, he introduced me to all the fun. My saga began when I expressed interest in getting a multipurpose bike that I could use at the velodrome as well as for cyclocross. Duncan and I found the Gunnar Street Dog frame and figured it would be perfect. 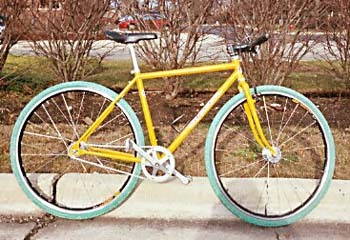 I ordered the frame with front brake braze-ons only. It cost extra to get the frame without back brake braze-ons. Go figure! The 853 Reynolds steel frame has track drop-outs and a higher bottom bracket for more clearance. I set it up with 63 inch gearing (42x18) and drop handlebars. I first experimented with offroad in the forest preserves around Chicago, riding on the easier wide paths and horse trails made from crushed limestone. It became obvious that first season that the frozen hoof prints were dangerous, as I had more than one encounter with them and was flipped out of my seat. I rode in the forest preserves the entire winter and had a fantastic time, hiding from the strong winds amongst the trees. The following spring, Duncan purchased his track'n'cross bike (as we had now christened them) and we began experimenting with more and more difficult terrain. We soon found ourselves climbing better and descending better. I even found an 'ATV' strip with lots of little 'dippity' hills and I was able to master catching air while still pedaling. Duncan entered his first cyclocross race that season and found out just how hard it was to dismount and then mount a fixed gear bike on the run! This year we decided to try single track as it presented a new challenge, one that we had not yet encountered. Well! Let me tell you it has been one fun fall season for us! We started using the single track trails near our homes, and pretty soon we found ourselves seeking more and more difficult trails. First, we went to Northern Wisconsin to ride in the Chequamegon National Forest. There are miles and miles of trails which are mostly single track. Because the hills were steeper than we were accustomed to, reaching my front brake required getting in the drops which shifted my center of gravity way forward. I didn't like the feeling of sticking my nose so far forward and started experimenting with keeping my hands close to the stem and pushing down hard on the pedals in reverse on each up stroke. The first few times were filled with white knuckle fright and the bike sometimes got away from me. When that happened, I would bail out for safety. Whether because of ignorance of gravity and inertia, or just plain self-preservation instinct, I gradually learned how to practically stop the roll of my bike by applying reverse force on the pedals at the top of the arc. The evening after a ride my calves and hamstrings screamed from the additional stress. Even though we were using 35mm tires, we were able to negotiate most obstacles on the trails. Rocks, roots, and ruts ceased to be a threat as our confidence and skill improved. Our next venture took us to Northern Kettle Moraine in Wisconsin. It was almost too easy for us, and our egos soared to think we had achieved mastery over single track trails! The weekend of November 8 found us traveling to Kentucky. Specifically, to the Daniel Boone National Forest in Moorehead, where there are numerous trails of all skill levels. We certainly met our match in that forest! We rode a few of the trails but even on the 'easy' singletrack we had to walk a little more than we expected. However all was not lost on this trip because we had to ford streams several times on the trails and push through huge mud holes and that boosted our offroad confidence tremendously. After leaving Kentucky, we stopped at a few advertised trails located in Brown County, Indiana, home to the Hoosier National Forest. We found great maps of the trails that we feel we can manage and are planning a trip back just to ride a few. When we do, we'll let you know how it all went. As you can imagine, we have inflated our egos and are ready to tackle even more trails. We have discovered the beauty of the fixed gear, offroad ride and we are going to continue to pursue as many trails as we can find. Pam Molitor is a born again fixer. All photos © Pamela J. Molitor. Fancy a Streetdog? Here's the Gunnar website.